Moving home is known to be one of the three most stressful things you can experience in life, a difficulty that is increased if you are relocating interstate. You’ve packed all your possessions into boxes and are frantically trying to navigate the day of the move itself, transporting your family and everything you own from one neighborhood to another, before starting to unpack in an entirely new house. All of this involves many important decisions, including choosing a moving company that you trust to handle your things with care. Before arranging the practical aspects of your house move, consider some of these tips to ensure you choose the best removal company for your needs and one that you can rely on. Have any of your family or friends moved home recently? Has anyone in your current or your future neighborhood moved in the last year? Word of mouth recommendations based on the experiences other people can often be one of the most useful ways to find the best removal, storage and packing businesses in your area. Ask your real estate agent for recommendations, as they have experience dealing with all aspects of the industry and may be able to put you in touch with a reputable mover. Your real estate office may also be able to offer you information based on the recommendations of former clients or removal businesses that they work closely with. Research local businesses online and check comparison websites for reviews and testimonials. The more research you do before booking them, the more at ease you will feel when they start handling your furniture and drive off with everything you own. There are many licenses, accreditations, and insurance qualifications you should look for when hiring movers. Check with your insurance provider to make sure that your household policy will cover your possessions when in transit. If it does not, research movers insurance to ensure you are covered, so that in the case of anything going wrong, you cannot be held accountable and will not lose out on anything. Ask the moving company you are looking into about their insurance so that you are not left out of pocket in case of any unexpected circumstances. Ask your moving company about the Replacement Value Protection they offer, which is a form of insurance that means the company will be legally liable for any damage or loss up to an amount that represents the total estimated value of the property they are transporting. A common way of working this out is often by multiplying the weight of your property in pounds by $10.00. Replacement Value Protection can be crucial, so make sure this is what you are offered, rather than a depreciated value. You also need to check the company’s stance on owner packed and mover packed property. A written document providing all of the details on their legislation, terms, and conditions should be given to you before the day that you move. Any moving company that you hire must be accredited by the Federal Motor Carrier Safety Administration and have a rating of at least satisfactory with the Better Business Bureau, according to the American Moving and Storage Association. Arrange for a consultation and price estimate with the moving company before officially hiring them. Use this opportunity to ask any questions you have, including about their staff, liability, equipment, and end of move services, such as unpacking. 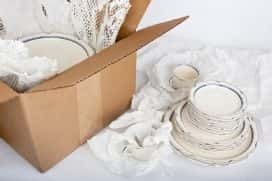 To get an accurate estimate, use this time to show them exactly what they will be transporting, how many boxes, and any valuable or fragile items. You can discuss how your move is handled and give any specific instruction you may have, to see how the company would approach transporting your property safely and efficiently. Communicate your expectations during your initial consultation and find out exactly what you can expect from the staff on the day of your move. Discuss your available price point and take into account the estimate you are given. Hiring a moving company can be expensive, so set yourself a budget but don’t forget that you’re paying for a service that will be handling everything from inside your home.